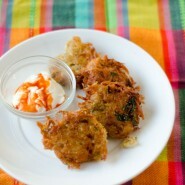 Sina Mizrachi of The Kosher Spoon submitted our final semifinalist for the JewishMOM.com Chanukah Recipe Contest. In a bowl, combine all the ingredients until fully incorporated. In a large skillet, heat oil for frying. Once the oil is really hot, form round patties and drop them in the oil. Cook on both sides until the latkes get a rich golden color, about 3-4 minutes per side. Tip: Try to remove as much excess liquid as you can from the potatoes, by squeezing out the liquid as you form the round shape.